Affiliation: Electronics Laboratory, Swiss Federal Institute of Technology, Zurich, Switzerland. While silicon is bulky and rigid, plastic electronics is soft, deformable and lightweight. Flexible electronic devices like rollable displays, conformable sensors, plastic solar cells and flexible batteries could enable applications that would be impossible to achieve by using the hard electronics of today. So far, the effective commercialization of such technology has been mainly prevented by cost and performance constraints. However, for some applications, the specific functionalities provided by flexible, biocompatible, conformable and light plastic electronics are much more important than the aforementioned obstacles and future scenarios can be realistically foreseen. The development of flexible electronic circuits plays a crucial role in all such applications. Flexibility can be achieved by direct fabrication on plastic foil , by peeling off a polymer layer spin coated on a rigid substrate , by transfer printing  or by spalling the thin top layer from a crystalline silicon wafer after device fabrication . The scenario is even more heterogeneous when looking at the variety of materials employed for the active layers. Inorganic materials including silicon nanomembranes  or nanowires , organic materials  or amorphous oxides  are all possible options. 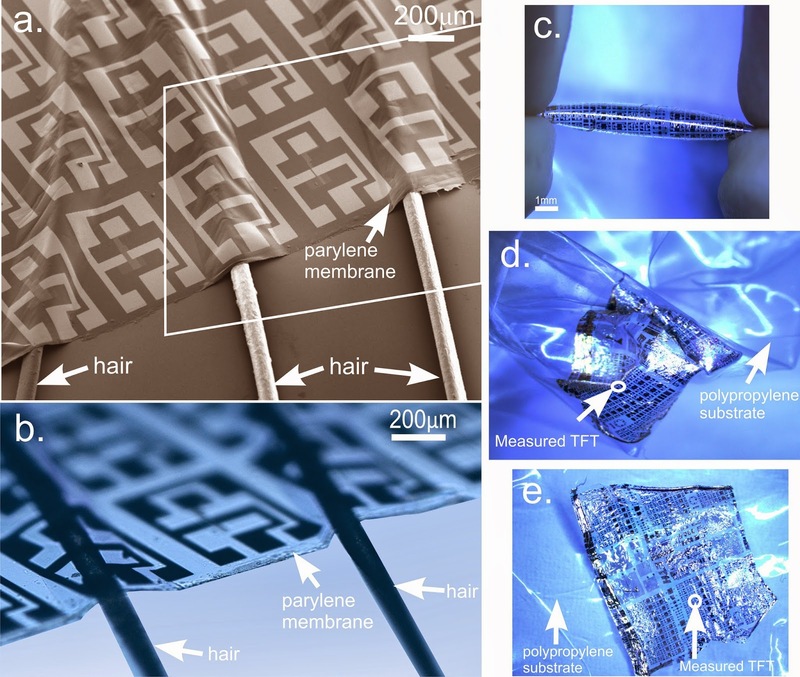 Recently electronics on very thin substrates has shown remarkable bendability, conformability and lightness, which are important attributes for biological tissues sensing, wearable or implantable devices [5,8,9]. All the mentioned approaches and materials offer advantages and suffer from limitations. A unique and universal integration scheme has not been developed yet and at the moment the choice mainly depends on specific applications. In our recent work  we propose a wafer-scale process scheme to realize ultra-flexible, lightweight and transparent electronics on top of a 1μm thick parylene film which is released from the carrier substrate after the dissolution in water of a Poly-Vinyl-Alcohol (PVA) layer. The thin substrate ensures extreme flexibility, which is demonstrated by transistors which continue to work when wrapped around human hairs. In parallel, the use of amorphous Indium Gallium Zinc Oxide (a-IGZO) as semiconductor and high-k dielectric enables the realization of analog amplifiers operating at 12V and above 1MHz. The possibility to implement such scheme at wafer scale and the use of a-IGZO could represent a good compromise between large area integration and performance and, hence, a valid alternative to similar reported approaches [5, 9]. After the release, electronics can be transferred onto any object, surface and on biological tissues like human skin and plant leaves. We fabricate Thin Film Transistors (TFTs) and circuits on top of a 1μm thick parylene film. Parylene has been chosen because it is biocompatible and resistant to acetone and chemicals necessary for lift-off and etching process steps. In our experiments, PVA constitutes the first soluble layer needed to release, in water, the silicon wafer used as support during the fabrication (Fig.1b-e). Depending on the application, an additional Poly-Vinyl-Acetate (PVAc) film is added to improve the adhesion and enable the removal of electronics after use. The devices are formed by Indium Gallium Zinc Oxide which is used as semiconductors and ensure electron mobility greater than 10cm2/Vs, transparency in the visible spectrum and large area deposition. The insulator is Al2O3 which has excellent dielectric properties. The contacts are made up by thin layer of chromium and gold. We also fabricated fully transparent devices in which metal contacts are replaced by Indium Tin Zinc Oxide (Fig.1). The maximum process temperature reached during the fabrication is 150°C. The final thickness of the TFT structure is 145nm for the non-transparent TFTs and 175nm for the transparent ones. In order to test and prove the reliability of our approach, we also designed and fabricated analog amplifiers based on the previously described TFTs. Figure 1: Structure of thin film transistors fabricated on a silicon carrier chip covered with two sacrificial layers and a non-soluble layer which is parylene in our experiments. Poly-Vinyl-Alcohol (PVA) is water soluble and enables the release of the thin parylene membrane from the silicon substrate. Poly-Vinyl-Acetate (PVAc) film is added to improve the adhesion and enable the removal of electronics after use. Transistors and circuits are fabricated by using a-IGZO as semiconductor and Al2O3 as dielectric. Gold is used for the contacts in non-transparent devices (left in the picture) while ITO is used in case of the transparent version of the device (right). It is worth mentioning that the use of rigid supports (glass or silicon) during the fabrication, mitigate some issues, like substrate thermal expansion or water absorption, which are encountered in case of direct fabrication on foils and which limit the feature resolution and alignment, therefore, yield and performance. After the fabrication, the chip is put in water to selectively dissolve the PVA layer and release the parylene membrane. For a 2-inch wafer this operation takes approximately 30 minutes after which the circuits are floating on water. The membrane can then be fished and transferred onto the final destination substrate which can be any arbitrary rigid or flexible support or any organic or inorganic surface (Fig. 2). Figure 2: The proposed process scheme can be implemented at wafer scale. Here, we demonstrate the feasibility of such approach in the case of a 2-inch wafer. The water starts dissolving the PVA layer from the borders of the wafer and slowly proceeds towards the center. The whole releasing procedure takes approximately 30 minutes after which the wafer sinks while the membrane floats on water. 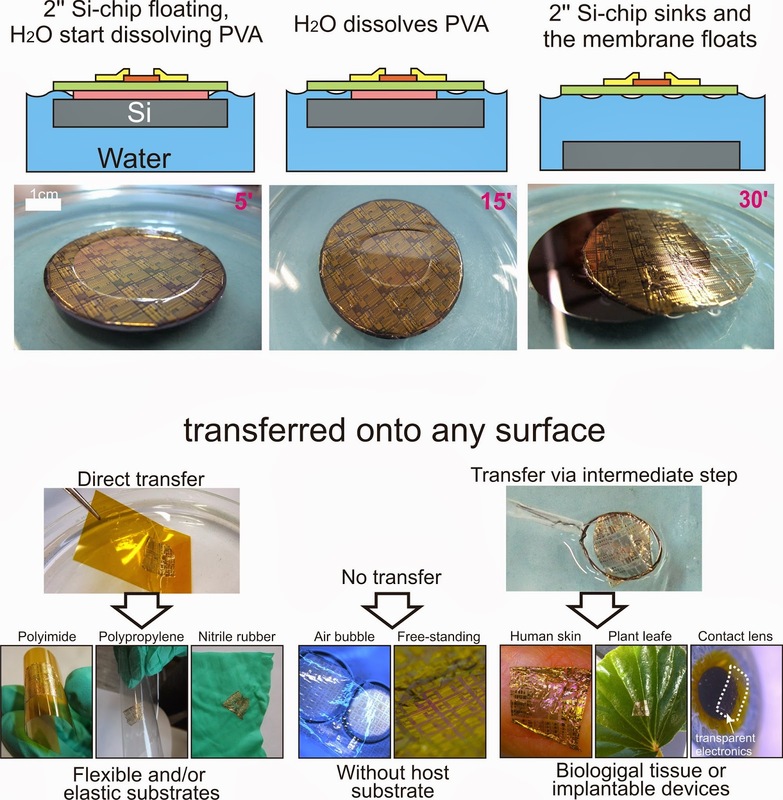 After the release of the hosting support, the membrane is fished and transferred onto flexible and elastic foils, textiles, biological tissues and implantable devices. The thin substrate ensures extreme flexibility and conformability. In order to experimentally investigate the ultimate limit of the bending stability, we transferred the membrane on top of a glass substrate where some fragments of human hairs, which have a radius of about 50μm, had been previously placed. TFTs having the gate region bent around the hairs are fully operational. The mechanical properties of the thin substrate are further investigated by transferring the devices onto a 100μm thick polypropylene foil. This facilitates the handling and manipulation of the membrane while minimizing the strain induced by the substrate, thanks to the poor adhesion between polypropylene and parylene. The membrane on the polypropylene foil is folded to a radius of 750μm (Fig.3c), then repeatedly crumpled in the hands (Fig.3d) and finally re-flattened (Fig.3e). After the curling, we were able to measure only the non-transparent transistors, while none of the transparent devices was functioning. We, in fact, observed cracks in the ITO layer -- most probably due to induced strain after the release. Figure 3: (a) Scanning electron microscopy picture of transistors wrapped around three fragments of human hairs placed on a glass support. The thin membrane ensures high flexibility and conformability and it wraps around the hairs which have a radius of approximately of 50μm (tensile strain, ε=0.4%). (b) Optical microscope picture of the area highlighted by the white box in a. (c, d, e) The membrane is transferred on a 100μm thick polypropylene foil which is folded in hand (bending radius is about 750μm) aggressively crumpled in hands and then re-flattened. The devices are still working either when bent around the hair and when curled by hands. The membrane is also light, and biocompatible. To design a concrete application which takes advantages of such capabilities, we transferred the parylene membrane, with on top transparent transistors and strain gauge sensors, on a commercially available plastic contact lens (Fig.4). After transferring the lens onto an artificial eye, TFTs continue to function and could be used for signal amplification in future developments. In the design of a real system particular attention must be paid to the packaging which has to mitigate or eliminate the effects of the humor aqueous of the eye. 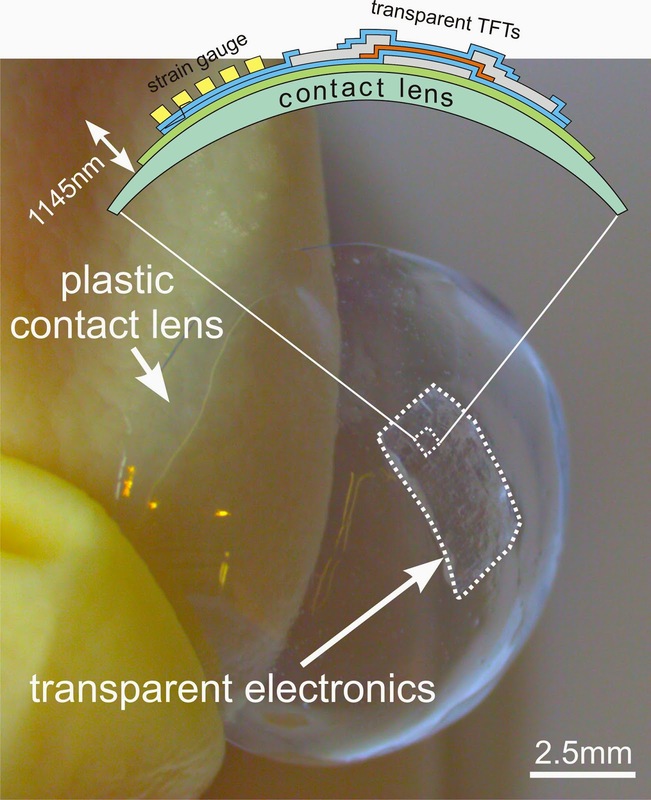 Figure 4: The membrane with on top transparent TFTs and gold strain gauge sensors is transferred on a plastic contact lens held between two fingers. Such technology could find application as smart contact lenses able to monitor and diagnose glaucoma disease. Thereby, the developed technology could find application as smart contact lenses able to monitor and diagnose glaucoma disease and it could offer significant advantages over existing solutions  in terms of thickness, lightness and transparency and, hence, comfort for the patient. Future works should be focused on the development of wireless communication schemes and on the powering of the system. N. Münzenrieder, L. Petti, C. Zysset, G.A. Salvatore, T. Kinkeldei, C. Perumal, C. Carta, F. Ellinger, G. Troster, “Flexible a-IGZO TFT amplifier fabricated on a free standing polyimide foil operating at 1.2 MHz while bent to a radius of 5 mm”, Proceedings of International Device meeting IEDM (2012). Abstract. Kuniharu Takei, Toshitake Takahashi, Johnny C. Ho, Hyunhyub Ko, Andrew G. Gillies, Paul W. Leu, Ronald S. Fearing, Ali Javey, “Nanowire active-matrix circuitry for low-voltage macroscale artificial skin”, Nature Materials, 9, 821-826 (2010). Abstract. Matthew A. Meitl, Zheng-Tao Zhu, Vipan Kumar, Keon Jae Lee, Xue Feng, Yonggang Y. Huang, Ilesanmi Adesida, Ralph G. Nuzzo, John A. Rogers, “Transfer printing by kinetic control of adhesion to an elastomeric stamp", Nature Materials, 5, 33 - 38 (2006). Abstract. Davood Shahrjerdi, Stephen W. Bedell, “Extremely Flexible Nanoscale Ultrathin Body Silicon Integrated Circuits on Plastic”, Nano Letters, 13, 315-320 (2012). Abstract. Dae-Hyeong Kim, Jong-Hyun Ahn, Won Mook Choi, Hoon-Sik Kim, Tae-Ho Kim, Jizhou Song, Yonggang Y. Huang, Zhuangjian Liu, Chun Lu, John A. Rogers, "Stretchable and Foldable Silicon Integrated Circuits". Science, 320, 507-511 (2008). Abstract. Tsuyoshi Sekitani, Ute Zschieschang, Hagen Klauk, Takao Someya, "Flexible organic transistors and circuits with extreme bending stability". Nature Materials, 9, 1015-1022 (2010). Abstract. Kenji Nomura, Hiromichi Ohta, Akihiro Takagi, Toshio Kamiya, Masahiro Hirano, Hideo Hosono, “Room-temperature fabrication of transparent flexible thin-film transistors using amorphous oxide semiconductors”, Nature, 432, 488-492 (2004). Abstract. Martin Kaltenbrunner, Matthew S. White, Eric D. Głowacki, Tsuyoshi Sekitani, Takao Someya, Niyazi Serdar Sariciftci, Siegfried Bauer, "Ultrathin and lightweight organic solar cells with high flexibility". Nature Communications, 3:770, (2012). Abstract. Martin Kaltenbrunner, Tsuyoshi Sekitani, Jonathan Reeder, Tomoyuki Yokota, Kazunori Kuribara, Takeyoshi Tokuhara, Michael Drack, Reinhard Schwödiauer, Ingrid Graz, Simona Bauer-Gogonea, Siegfried Bauer, Takao Someya, "An ultra-lightweight design for imperceptible plastic electronics". Nature, 499, 458-463, (2013). Abstract. Giovanni A. Salvatore, Niko Münzenrieder, Thomas Kinkeldei, Luisa Petti, Christoph Zysset, Ivo Strebel, Lars Büthe, Gerhard Tröster, “Wafer-scale design of lightweight and transparent electronics that wraps around hairs”, Nature communications, 5:2982 (2014). Abstract.